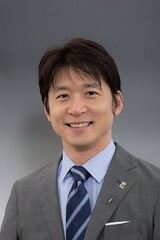 Post written by Yoji Takeuchi, MD, from the Department of Gastrointestinal Oncology, Osaka International Cancer Institute, Osaka, Japan. Updated autofluorescence imaging (AFI) could show superior detection of flat colorectal neoplasms in the right-sided colon compared with conventional white-light imaging (WLI) in this prospective multicenter randomized controlled trial. Since flat (non-polypoid) neoplasms have a greater association with carcinoma compared with polypoid neoplasms and are easily missed, improvement in detecting flat neoplasms is needed. Although AFI improved flat neoplasm detection in the right-sided colon, it did not improve detection of overall of polypoid colorectal neoplasms and in the left-sided colon. The mechanism to miss colorectal neoplasms may be different according to lesion characteristics (morphology and location). We need to utilize different devices to improve detectability to cover different mechanisms for missing all polyps in any location, and a combination of different devices should be assessed to improve overall detection. Image enhanced endoscopy (IEE), such as AFI, narrow-band imaging (NBI), or blue laser imaging (BLI) can improve flat polyp detectability compared to white-light imaging (WLI) and should be used in daily practice. Figure 1. Endoscopic images of a flat adenoma detected in the autofluorescence imaging group during the study. A, Autofluorescence image. 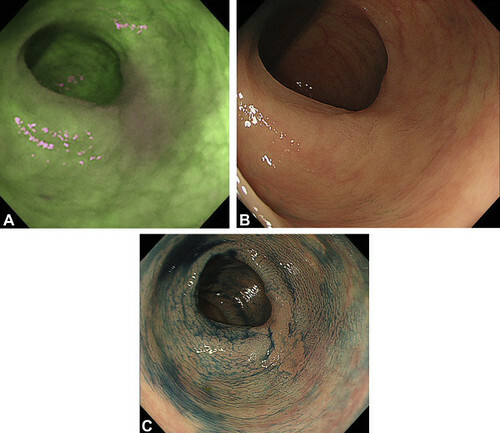 A 15-mm-sized magenta lesion in the descending colon was detected in the surrounding green background mucosa. B, White-light image. Because the lesion was totally flat and similarly colored to the background mucosa, it was difficult to recognize. C, Chromoendoscopic image using .4% indigo carmine. The lesion could be recognized as a nongranular laterally spreading tumor. Finally, the lesion was removed by endoscopic submucosal dissection, and pathologic diagnosis was high-grade adenoma.